28 Towpath on the Riverfront i Port Elizabeth, Sydafrika: Reservér nu! 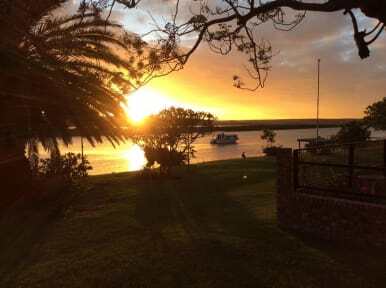 28 Towpath on the Riverfront we are creating an environmentally sustainable riverfront travel accommodation and platform for responsible travelers to relax in the peaceful Redhouse village which lies in the heart of Port Elizabeth. We encourage responsible travelling and give travelers opportunities to actively support local communities as they travel though the Eastern Cape and South Africa. We are involved with the surrounding communities in various Music Therapy, Permaculture, Conservancy, Art, Education, Internships and Social projects. 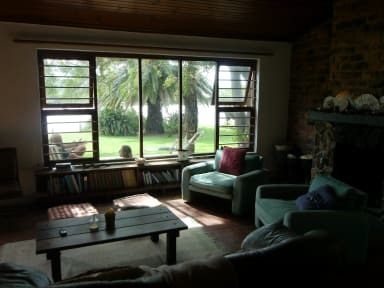 We offer you big bedrooms, a large lounge that encourages yoga, farm-style-kitchen, and indoor garden, a young fruit forest and while you shower the bathrooms greywater system feeds a banana and payaya garden, sit on the front veranda, watch the sunrise over the river, or enjoy a braai! We can provide windsurfing lessons and equipment hire of canoes, paddleboards, a rowing boat and windsurfers. There is a large back garden suitable for camping and off- street parking. Located in a quiet village, on the edge of PE, with a permaculture design garden, 10km from beach, 45km from Addo and other Game Parks. The rivers is a tidal salt water estuary, with abundant bird life, walking and hiking trails. This riverfront accommodation has a rural countryside rustic feel, with its wooden floors and large bedrooms with high ceilings. The rooms all have big windows that offer lots of fresh air and light. All rooms can lock and have locker and cupboard space. During summer we can offer a fan and mosquito net, but note that our house is situated in a Malaria Free Area. The river offers tidal salt water from the sea and will does not offer breeding conditions for mosquitoes. This property may pre-authorise your card before arrival. In case the credit card is not valid, the customer will be contacted to provide the details of another valid card in order to guarantee their booking. Failure to do this might result in the cancellation of the booking.